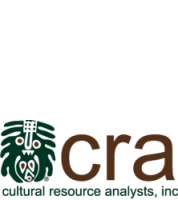 Pottery and Tools Recovered from the Carskadon Site Tell a Story | Cultural Resource Analysts, Inc. Yesterday I introduced the Carskadon Site that CRA excavated during the AOS project. The site has a Middle Woodland occupation (circa A.D. 1–250). Many of the traits observed in the ceramics and lithic artifacts indicated an affiliation with Havana-Hopewell seen elsewhere in the region at this time. Today I’ll expand on the discussion from yesterday. A wide variety of stone tools were recovered from the site. What do the stone tools from the site indicate about the daily activities of the inhabitants at Carskadon? The heavy density of chert flaking debris strongly points to flaked tool manufacture at the site. A sample of flaked stone tools called Snyders that were recovered from cooking and trash pits at the site. Snyders are commonly found on Havana-Hopewell sites and were used as both projectile points and knives. In addition to flaked tools, some ground stone was also recovered. The two celts/adzes at the bottom were likely used for woodworking and were made from igneous or metamorphic rock collected from local glacial till deposits. The pottery vessels also provided a wealth of information about past behavior and activities at the site. For instance, many of the pots (jars) showed evidence of having been used for cooking as both soot and fire clouds were visible on the exterior surface. Based on residue from the interior of several vessels, many were likely used for cooking starchy seeds such as goosefoot and knotweed as well as boiling hickory and hazelnuts. This finding corresponds to the large number of cooking pits that were identified and excavated at the site. Some of the jars were also highly decorated, conforming to designs found throughout the region. As noted above, animal remains were plentiful at the site. In some cases, bones were later used as tools. Long bones were used by the inhabitants to make pins or awls that could be used for a number of purposes, including as hair pins and hide working or piercing tools. In several cases, deer antler was later used as billets in the flaking of stone tools . Another type of pin made from copper was also found at the site. These pins were probably used as personal ornaments and represent the highly-sought after raw material mentioned at the beginning of this discussion. Based on the fact that many of the cooking and trash pits at the site were found overlapping each other, it is not likely that Carskadon represents a single occupation such as a large village or town. Instead, the overlapping pits indicate that at least four separate occupations occurred during the Middle Woodland and it may well be the case that it was the same group of people each time (extended family or perhaps part of a clan). If true, then the actual number of people during any given occupation was not likely great, perhaps 25 or less. Carskadon would then represent the remains of numerous occupations with each stay at site being for a relatively short period of time (1–2 months). Each occupation was likely geared to the collection and processing of the local resources mentioned above. Once completed, the group would then proceed to another location in order to find additional resources. This interpretation is different from studies at other Havana-Hopewell sites throughout the region where the associated occupation has been interpreted as year-round settlements by sedentary people.